Heaven Is For Real Review! 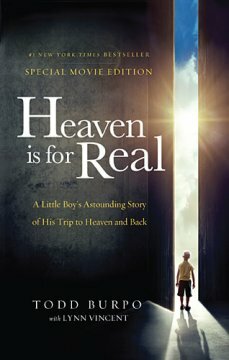 So, with all the talk about the Heaven is for real movie I decided I would read the book by Todd Burpo, and thanks to booklookbloggers.com who gave me a complimentary copy, I’m able to share it with you. I’ll be honest, after I got it, it took me a while to pick it up and read it, usually when I get a book to read I pick it up right away and just can’t seem to put it back down, but, with this one for some reason with all the thoughts of what if, and could this really be real and whatnot I had some reservations about actually reading it. Of course I know that Heaven is real, I know that God and Jesus are real, but just the fact that a little boy could have visited Heaven and come back… I wasn’t so sure. But, finally I went ahead and picked it up, and well I couldn’t put it down, it was such a great book! Now, I’m not sharing the book to say whether or not I think it did or did not happen, but it is a really good book, and who am I to say that it didn’t really happen. So, for those of you who may not know all about the book I’ll share a bit with you. The book starts out telling you about the family on a fun trip and then goes in to explain how they had a quite horrible year with the fathers health going from shattering his leg, to getting kidney stones, and then he ends up getting a lump on his chest diagnosed as hyperplasia. Shortly after this the issues with Colton-the boy who went to heaven and he ends up having a ruptured appendix. They go through trials and a very tough time getting a diagnosis and then once they have one, they go through more trials trying to help him recover. Then, once they are home the tales of what Heaven is like with great detail that aligns perfectly with scripture started being said by this young little boy whom would have had no way of knowing or any way of just imagining these things up.